Problem Description The disease initiates as grey or dark brown lesions covered with erect hair like sporophores on stem, branches, leaves and pods. The disease initiates as grey or dark brown lesions covered with erect hair like sporophores on stem, branches, leaves and pods. The lesions enlarge and girdle the stem. On stem grey mould is gradually replaced by grey or black mass containing black spordochia. In heavy infection, flowers drop and no pods are formed. 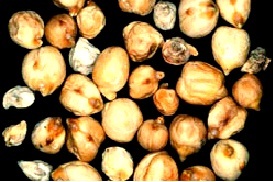 Infected pods bear small and shriveled seeds.